Montessori Community School of Rhode IslandWhat makes Montessori at MCS RI Unique? What makes Montessori at MCS RI Unique? Montessori Community School of RI, Providence, RI. At Montessori Community School of RI all classrooms are mixed-age. Children gain real confidence by experiencing the process of independent choice, repetition, and mastery. All of our learning environments are child-centered and are carefully prepared to facilitate independence, problem solving, and creativity. Children are free to move about the classroom and choose activities based on their interests. Teachers invite children to new lessons as they are ready. Mixed Age groups: At Montessori Community School of RI all classrooms are mixed-age where younger children observe and learn from their older classmates and older children increase confidence and gain leadership skills by teaching their younger classmates. This cycle lends itself to a sense of internal mastery and accomplishment. Independent Choice: Children gain real confidence by experiencing the process of independent choice, repetition, and mastery. This intrinsically rewarding process encourages inner discipline, a love of learning, and eventually allows a spirit of kindness, generosity and connection to ensue. When children have choices, they are more likely to develop a love of learning and skills for self directed development. Prepared environments: All of our learning environments are child-centered and are carefully prepared to facilitate independence, problem solving, and creativity. The learning materials in our classrooms are hand crafted, self-correcting and specially designed to meet the developmental needs of each child. Teachers continually assess the environment in order to meet the changing needs of the children. The Work Cycle: Children are free to move about the classroom and choose activities based on their interests. Teachers invite children to new lessons as they are ready. Once a child is introduced to a material, they can explore however they’d like and for as long as they like. Children determine when they feel finished with work and return it back to where they found it. Children have several hours to choose work, practice, learn new lessons, and master their chosen work. This cycle promotes a respectful community and helps to develop deep concentration, problem solving, and creative thinking in children. Fostering Community: Within the structure of the work cycle, children gain experience with delayed gratification and respect for one another’s work and interests. Imagine a room filled with children 3-5 years old enamored with what one another can do, and waiting patiently to have a turn to try themselves! A spirit of connectedness and joyful collaboration inhabits the space. The Role of the Teacher: Our teachers spend time reflecting on their practice and are guided by the needs and interests of the children. The role of the teacher is to guide and observe the children’s movements, choices, interests, behaviors, patterns, relationships etc. It is a complex and deliberate role that requires patience, training and practice. Family connections: At MCS RI we strive to be in contact with families weekly regarding their child’s experience at school. Through weekly notes home, to bi-weekly updates, and personal conversations through email or phone calls, the staff at work together with families to figure out how to best serve their unique child. A Diverse Community: We are a community of children and adults with different backgrounds, ethnicity's, ages, experiences, interests, and strengths. This creates an environment where curiosity and learning from one another happen naturally. A Peaceful Community: At MCS RI we believe, that if a child’s social and emotional needs are met, they will be more likely to focus, be joyful, and treat each other kindly. Teachers model peaceful collaboration and positive interactions daily. We work to protect the child’s deep concentration so they may reach a depth and flow of independent learning that serves the true unfolding of who he/she is meant to be. We observe that from this independent experience children complete an activity, satisfied, joyful and generous. Our community benefits as a whole when children are able to experience this deep state of concentration. A Nature school: Our nature and science curriculum is in a continual state of growth and development. We work to incorporate our natural urban landscape throughout all curriculum areas. Some examples are: peace table with a nature discovery basket, a verma-composting bin, composting our food scraps, flower arranging, watering plants, planting seeds, literature about the natural world (animals, farms, families, etc.) art projects with a nature focus, nature walks in the large park across the street. In addition, we have fostered an ongoing collaboration with Side Walks End farm. At our new school we will develop our very own urban garden and outdoor classroom to enhance our nature school curriculum. In addition, we hope to partner with local farms on the south side to enhance our nature school curriculum. The Visual Arts and Music: Art and Music are integrated into all areas of the curriculum. In addition, we have a music and movement class each day. Art materials are available throughout the morning for exploration as well as other more themed projects relevant to the children's interests and abilities. 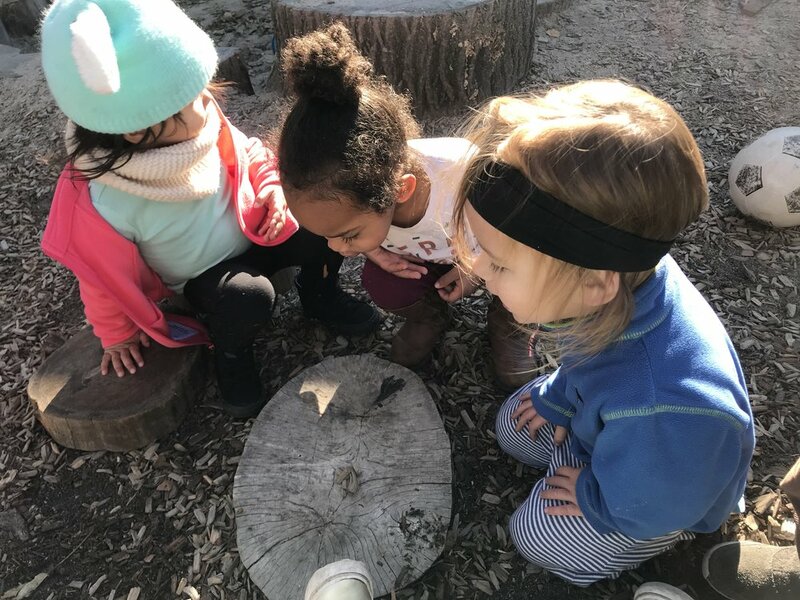 In addition, our after school program, Roots and Wings, is an art and nature based program that integrates both areas of the curriculum indoors and out. A Bilingual Education: In the Toddler Classroom English and Spanish are spoken with students throughout the day. The vision for the future is to become a dual language Montessori program. We are in the stages of doing research on best practices for implementing a dual-language program in a Montessori environment.